Last week had a slow start for options trading, but the activity finally started to pick up as the week went on. I surprisingly put on or rolled 17 different option positions throughout the week. Unfortunately the closing positions weren't as plenty or as profitable as the last month or so, but sometimes the markets just move against you and there's not much you can do about it. Hormel Foods took a bit of a dip last week, but unfortunately I caught this after the rebound had already started so the option premium wasn't quite as juicy as I would have liked, but it was good enough to put on as a bit of a hedge to the open call option that I have against my current shares of Hormel. If Hormel is trading below $32.50 at expiration then I'll have to buy another 100 shares of the company at an adjusted cost basis of $31.90 or about 4.1% lower than where it was trading at the time. The valuation at that level looks decent at 19.5x 2016's earnings and 19.3x 2017's estimates. The YOC for this lot of shares would be 2.13%. 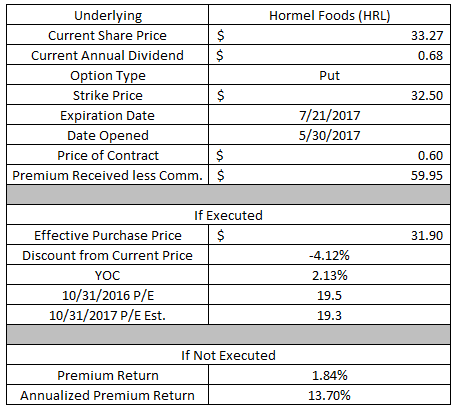 If Hormel is trading above $32.50 at expiration then the option would be OTM and I would get to keep the full option premium as profit. The $59.95 of option premium would represent a solid 1.84% return on the $3,250 of capital securing the position. Through expiration that would be equivalent to a 13.7% annualized return. Lowe's announced earnings earlier this month and investors weren't thrilled with the results. Although long term investors should enjoy the decline as it represents a better buying opportunity and the upcoming dividend increase doesn't hurt either. While this is technically a put broken wing butterfly I'm treating it as a put ratio spread. Thank you weird brokerage rules. Ideally Lowe's share price would drift down to the short put strike at expiration in order for me to maximize the profit potential. After commissions I received a $29.82 credit via the option premium. The max profit I can make on this position is $129.82 with the max loss being $770.18. If Lowe's is trading higher than $79.50 at expiration then all of the contracts would expire OTM. I would be able to keep credit received at order entry as profit. If Lowe's is trading at $78.50 at expiration then I will be able to realize the max profit on the position of $129.82. If Lowe's is trading below the $77.20 breakeven then I will likely take ownership of 100 shares at that cost basis or would have to have to close the entire position at a loss. Micron doesn't exactly fit the mold of my preferred long term holdings; however, the story behind Micron is bullish over the short term and there's high implied volatility which means rich option premiums. If Micron is trading below $29 at expiration then I'll have to purchase 100 shares at an adjusted cost basis of $28.50. That would be for about a 3.2% discount from where the shares were trading at the time of order entry. 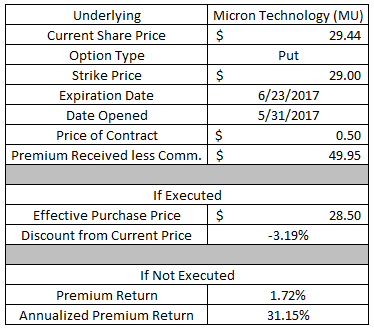 If Micron is trading above $29 at expiration then the contract would be OTM and I would get to keep the premium received as profit. The $49.95 of option premium would be a 1.72% return on the $2,900 of capital used to secure the contract. Through expiration that would be a hefty 31.2% annualized return. I still remain bullish on gold so I put on another bullish play on the yellow rock. The max profit on this position is the $51.71 credit received at order entry. The max loss is the $2.00 width of the spread less the credit received or $148.29. If GLD is trading above $119 at expiration then both options would be OTM and I would realize the max profit on this position. The $51.71 profit would be a 34.9% return on the capital at risk. If GLD is trading below $117 at expiration then I will realize the max loss on this position. Despite the markets' seemingly non-stop rise for the last few months, Nike hasn't joined in the party. With an ex-div date coming the next day I decided to buy some more shares of Nike while simultaneously selling call option against those shares via a buy write. I purchased 100 shares of Nike for an adjusted cost basis of $53.10 while selling a $53.50 strike call option for $62.95. If Nike is trading below $53.50 at expiration then the call option would be OTM so I would get to keep the option premium as profit. 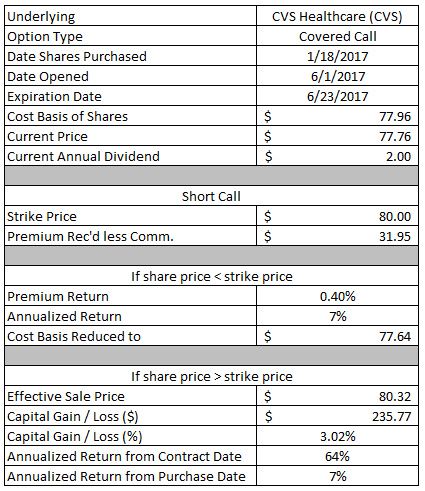 The $62.95 option premium would be a 1.18% return based on the $53.50 strike of the call option. My cost basis would be adjusted down to $52.47. If Nike is trading above $53.50 at expiration then the call option would be ITM and I would have to sell my 100 shares at an effective sale price of $54.13. That would be a solid 1.94% return in just a few weeks as well as being entitled to the next dividend payment. My goal is to just have the shares called away from me; however, with earnings coming up the following week I'm just fine selling another call option with rich option premium. I originally purchased these shares via an ITM put option back in early April. I think opened a covered straddle against these shares and the call option worked out great; however, the put side was so far ITM that I had to roll it forward to July. The cost basis on my shares of SLV is $16.74. 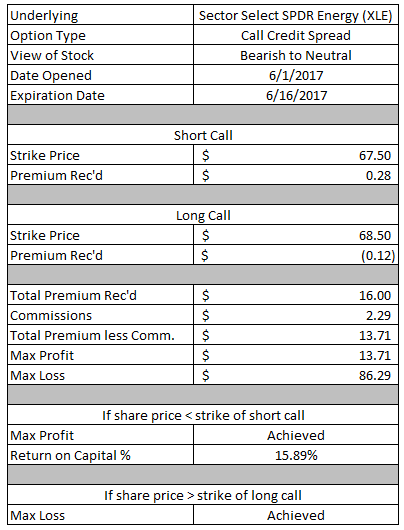 I sold the July 21 $17 strike call option against my shares and received $19.95 in option premium. If SLV is trading below $17 at expiration then the call option would be OTM so I would get to keep the option premium as profit. The $19.95 would be a 1.17% return based on the $17 strike of the call option. My cost basis would then be adjusted down to $16.54 per share. If SLV is trading above $17 at expiration then the shares would be called away from me at an effective sale price of $17.20. At that price that would be a 2.74% return. It's been a while since I've been able to sell options around my position in United Parcel Service because the share price was just a bit too far below from my cost basis. So I've had to be patient and wait for a chance to sell a call against my shares. By selling options against my United Parcel Service I've reduced my cost basis down to $110.69 although the share price is currently around $107 so there's still a long ways to go. 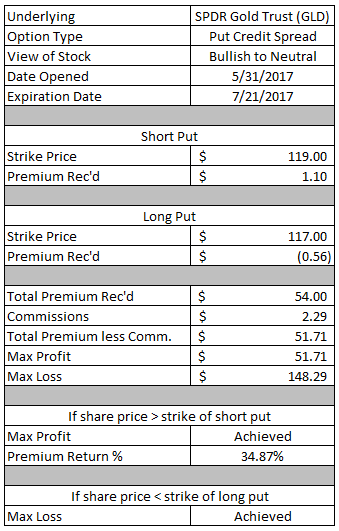 I sold the July 21 $110 strike call option and received $139.95 of option premium. If UPS is trading below $110 at expiration then the contract would be OTM and I would keep the option premium as profit. The $139.95 of premium would be a 1.27% return based on the $110 strike price of the option. The cost basis on my position would be reduced to $109.29. If UPS is trading above $110.69 at expiration then I'll have to sell my 100 shares at an effective sale price of $111.40. That would only work out to a 0.64% return which isn't ideal, but it would free up a bunch of capital to use for other option plays. 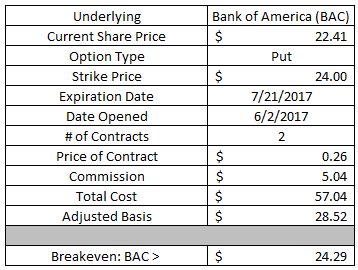 There was finally enough premium in the call options on Bank of America to make it worth selling calls against my shares. The cost basis on my Bank of America shares is $22.13 so I can afford to be a bit more aggressive with selling calls against the shares which I'll need to do going forward. I sold the July 21 $23.50 strike call option against my shares and received $34.95 in option premium. If Bank of America is trading below $23.50 then the contract would be OTM and I would get to keep the option premium as profit. 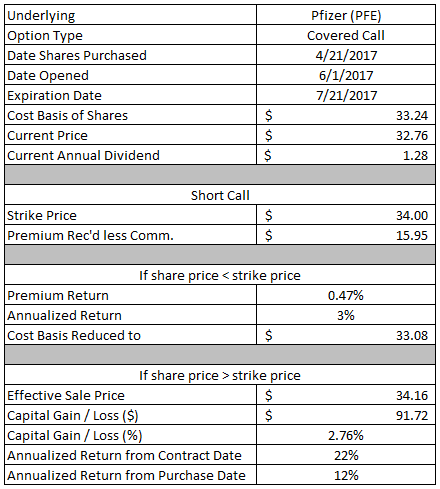 The $34.95 in option premium would be a 1.49% return based on the $23.50 strike price of the call option and would reduce to cost basis on my shares to $21.78. If Bank of America is trading above $23.50 then the call option would be ITM and I would have to sell my 100 shares at an effective sale price of $23.85. That would be a solid 7.76% return based on my current cost basis. This was a defensive move that I put on to help combat the existing put credit spread that isn't working out too well. The max profit that I can make on this position is the $13.71 credit received at order entry. The max possible loss is $86.29. If XLE is trading below $67.50 at expiration then I'll realize the max profit on this position. The $13.71 profit would be a 15.9% return on the capital at risk. If XLE is trading above $68.50 at expiration then I'll realize the max loss on this position. By adding on the call credit spread I converted my entire position in XLE to an iron fly with $66.50 and $68.50 long options and $67.50 short options. The ideal spot for this position is for XLE is move back higher to the $67.50 short strikes in order for me to realize the max profit on both positions. I currently have an open $78 strike put option on CVS in the June 23rd expiration so I added on a $80 strike call option against the shares that I own to convert the position into a covered strangle. The cost basis on my CVS shares is $77.96 which is pretty good considering I purchased the shares up at $83.20 back in January. 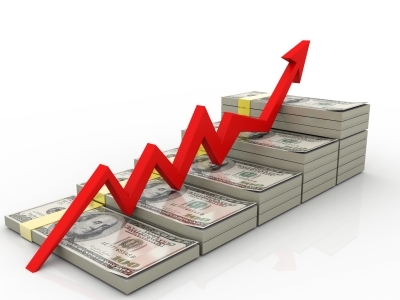 That's how you can consistently reduce the cost basis on your position by using options. I sold the June 23 $80 strike call option and received $31.95 in option premium. If CVS is trading below $80 at expiration then the contract would be OTM and I would keep the option premium as profit. The $31.95 would be a 0.40% return based on the $80 strike of the call option. My cost basis would be further reduced to $77.64. If CVS is trading above $80 at expiration then the contract would be ITM and I would have to sell my 100 shares at an effective sale price of $80.32. That would work out to a decent 3.02% return. My option position around CVS is now a covered strangle with short strikes at the $78 and $80 level. Much like my position in CVS I've been very successful at reducing my cost basis in V.F. Corporation with options. I originally purchased the shares for $53.50 per share and it's now down to $48.85. I received $139.90 in option premium at order entry. 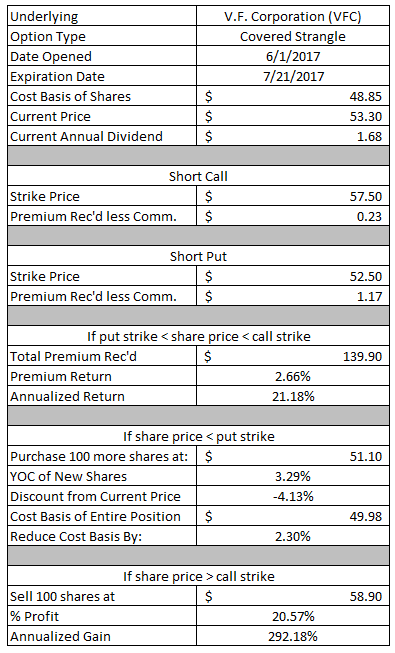 If VFC is trading between the two short strikes, $52.50 and $57.50, then both contracts would be OTM and I would be able to keep the full option premium as profit. The $139.90 would be a 2.66% return based on the additional $5,250 of capital securing the put side of the covered strangle. If CVS is trading below $52.50 at expiration then I'll have to purchase an additional 100 shares of V.F. Corporation at an adjusted cost basis of $51.10. That lot of shares would carry a YOC of 3.29% and would be purchased at a 4.1% discount from where VFC was trading at the time the position was opened. If CVS is trading above $57.50 at expiration then I'll have to sell my existing position at an effective sale price of $58.90. That would work out to a solid 20.6% return. In tax sheltered accounts such as my Rollover IRA I don't see why anyone wouldn't use the simple covered call strategy in order to consistently reduce the basis on your shares by limiting the upside potential. Since taxes aren't a concern it seems to me to be the right play. The averaged cost basis on my Pfizer shares is $33.24. Since Pfizer's share price has continued to decline since I added the shares to my portfolio it's been slim pickings for selling calls against the shares that I own that are above my cost basis. 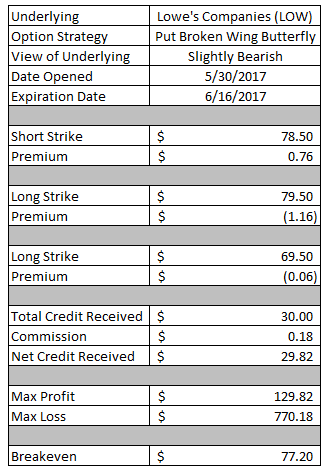 I sold the July 2017 $34 strike call option and received $15.95 in option premium. If Pfizer is trading below $34 at expiration then the contract would be OTM and I would just keep the option premium as profit. The $15.95 would be just a small 0.47% return based on the $34 strike of the call option, but it's better than nothing. My cost basis on these shares would be reduced by the premium received to $33.08. If Pfizer is trading above $34 at expiration then the contract would be ITM and I would have to sell 100 shares at an effective sale price of $34.16. That would work out to a 2.76% return which would be a decent 12% annualized return since the date the shares were purchased. I much prefer to be a seller of premium; however, every now and then I'll take a few shots at long option positions. 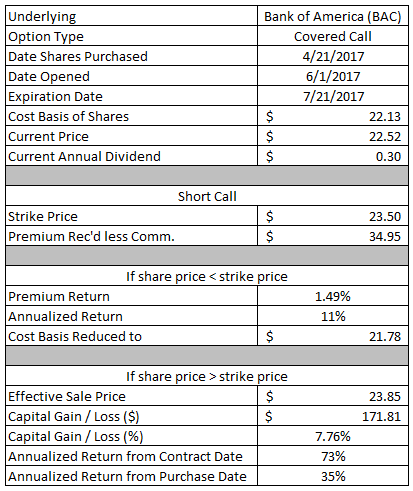 I purchased 2 $24 strike call options in the July 2017 expiration cycle. This cost a total of $57.04 to enter the position. If Bank of America is trading below $24 at expiration then the position would be OTM and I would realize a full loss on the position. If Bank of America is trading above the $24.29 breakeven price then I would realize a profit on this position. The profit would be determined based on where Bank of America is trading at expiration. I'm bullish on Bank of America since I still think the shares are undervalued and financials in general haven't participated in the market rally over the last few months. These call options should also enjoy rising implied volatility that leads to higher option prices since Bank of America will be announcing earnings during expiration week. Ideally Bank of America would head higher between now and expiration so I can take advantage of the share price moving in my favor as well as the rising implied volatility due to earnings and would close the position out before earnings are released. 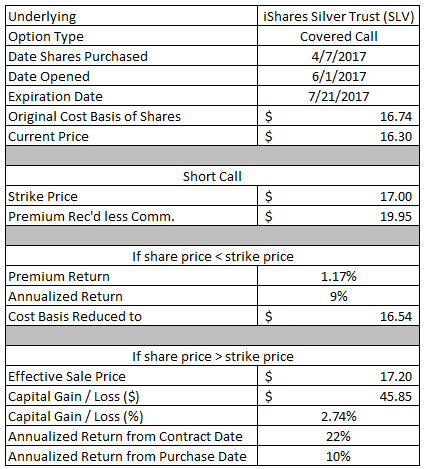 I was able to pick up an additional $0.47 per share in option premium by rolling this position out into the July expiration cycle. This brings my total credits on this position up to $1.82. The original breakeven on this position was $34.22 and by rolling out in time and collecting additional credits it's since be reduced to $32.18. 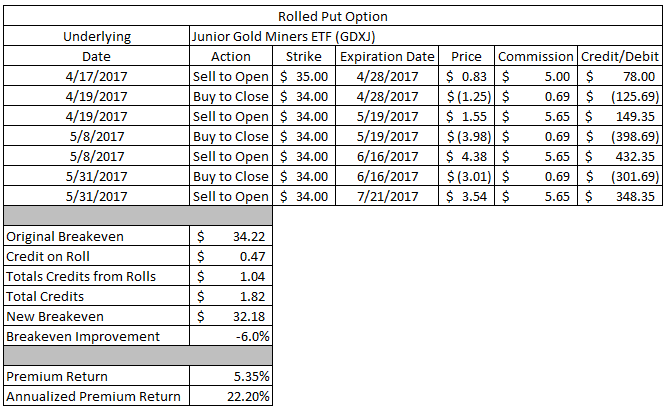 If GDXJ is trading above $34 at expiration then the contract will be OTM and I would be able to keep the full option premium as profit. The $1.82 in premium received would work out to a 5.35% return based on the $3,400 of capital securing the contract. Since the position was opened it would be represent a 22.2% annualized return. I've had to roll my put option on SLV forward once again in order to buy myself some more time to be right. 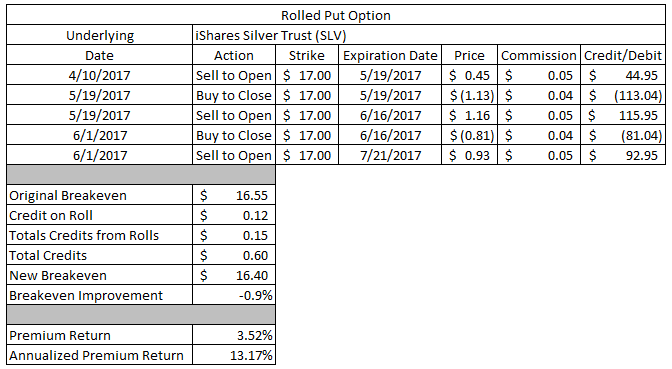 I'm not really interested in adding more shares of SLV to my portfolio so I will likely just keep rolling this position out in time until I can close it out early or if the share price is trading right below $17 near expiration so I can then sell an aggressive call option against the new lot of shares. I received an additional $0.12 per share credit by extending the duration of this trade out into July. The total credits received are up to $0.60. The original breakeven on this position was $16.55 and the additional credits received on the rolls has reduced it to $16.40. If SLV is trading above $17 at expiration then the contract would be OTM and I would get to keep the total credits received as profit. The $0.60 per share of option premium would be a solid 3.52% return. From the time the position was first opened that would be equivalent to a 13.2% annualized return. Archer Daniels Midland's share price hasn't cooperated as I would have liked since I opened this position. With time running out on the original put option I decided to roll it out in the July expiration cycle since I could do so for a solid credit. I was able to receive an additional $0.45 per share in credits by rolling the position out until July. That brings the total credits received on this put option up to $1.80. The original breakeven on this position was $41.65 and it's since be lowered to $41.20. If ADM is trading above the $43 strike at expiration then the contract would be OTM and I would be able to keep the full credits received as profit. The $1.80 per share of option premium would be a 4.18% return based on the $4,300 of capital securing the contract. From the date the position was initiated through the new July expiration the annualized return would be a solid 21.5%. Colgate's share price has continued to climb higher after the CEO came out saying that they would be willing to sell the company at $100 per share. Luckily though that's given me the opportunity to roll the call option out in time while collecting additional premium and improving my effective sale price. 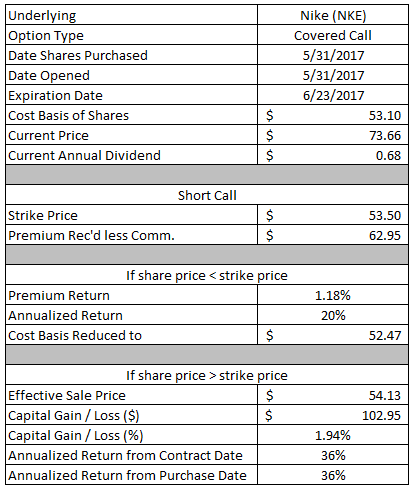 I was able to collect an additional $1.35 per share in option premium by rolling it out until July. That was just too hefty of a credit to pass up. That brings the total credits on this position up to $2.89 per share. The original effective sale price was $74.24, but with the additional credits received from the roll as well as the increased strike price my new effective sale price is $76.54. 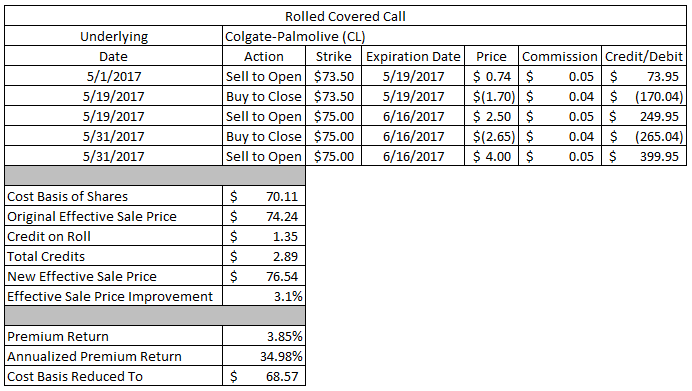 If Colgate-Palmolive is trading below $75 at expiration then the contract would be OTM and I would be able to keep the full option premium as profit. The $2.89 per share would be a solid 3.85% return based on the $75 strike of the call option. My cost basis on the shares would then be reduced to $68.57.